Shoshana Wayne Gallery is pleased to announce our new location on Jefferson Blvd in the West Adams district of Los Angeles. The gallery plans to re-open in the Fall/Winter of 2018 with, “Gallery Portrait” an exhibition looking back at our three-decade history, and celebrating our exciting future. 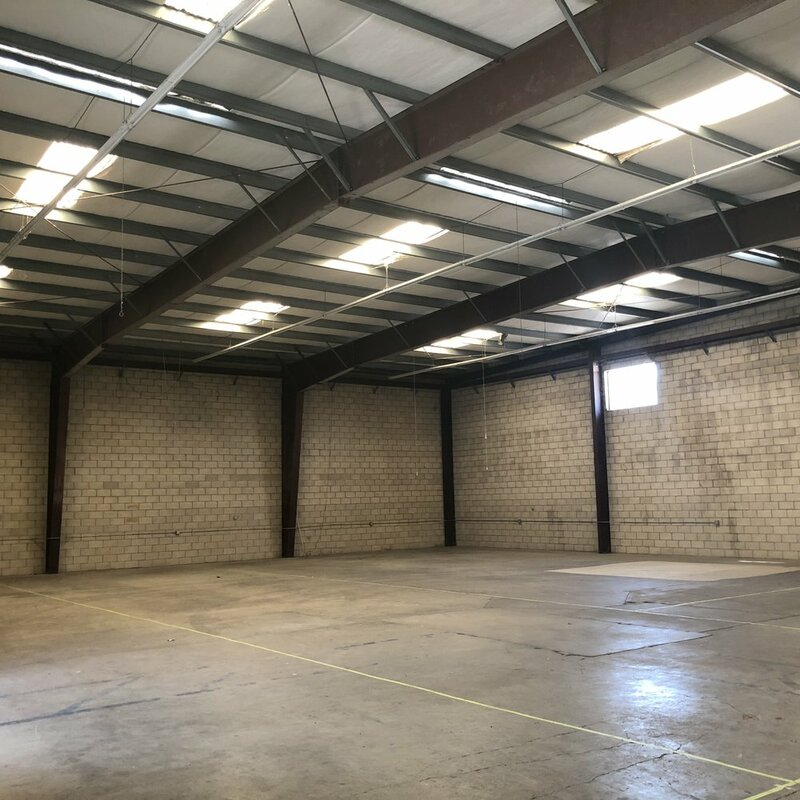 Construction on the space will begin soon, and we will keep you updated on our progress. 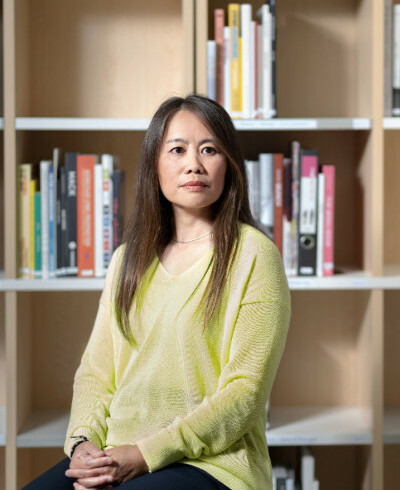 will represent Hong Kong at the 58th International Art Exhibition – La Biennale di Venezia, in an exhibition curated by Christina Li and co-organised by M+ and the Hong Kong Arts Development Council. The exhibition, Hong Kong’s Collateral Event of the 58th International Art Exhibition – La Biennale di Venezia, will open in Venice on 11 May 2019. 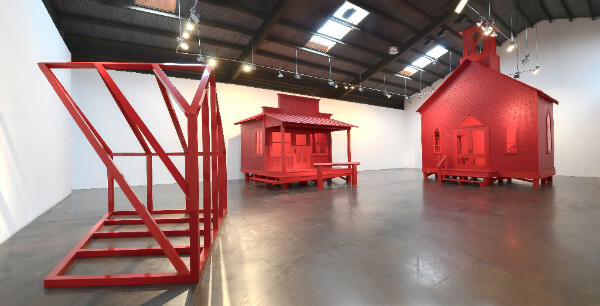 M+, Hong Kong’s new museum of visual culture in the West Kowloon Cultural District, and the Hong Kong Arts Development Council (HKADC) are pleased to announce the selection of Shirley Tse as the featured artist for Hong Kong’s participation in the 58th International Art Exhibition – La Biennale di Venezia. The internationally recognised Hong Kong–born, Los Angeles–based artist will present a new, site-specific body of work in a solo exhibition curated by Christina Li, an independent curator based in Hong Kong and Amsterdam. The exhibition will be submitted as a Collateral Event to the 2019 edition of La Biennale di Venezia, one of the most important forums for contemporary art in the world, and will be held between 11 May and 24 November 2019. The professional and press preview will take place on 8–10 May 2019. Every day an artist chooses to renegotiate societal structures in order to make their creative habit a profession. Because this kind of exercise drastically differs from the reliability of structured professions which grant dependable income, artists must also calibrate what it means to be personally successful. As every artist has a different studio practice, likewise his or her means of measuring success is different. Below, six seasoned artists weigh in on what success means for them. "The American Academy in Rome has announced the winners of the 2018–19 Rome Prize and Italian Fellowships. These highly competitive fellowships support advanced independent work and research in the arts and humanities. This year, 29 Rome Prizes were awarded to 29 artists and scholars, who will receive a stipend, workspace, and room and board for a period of five months to two years at the Academy’s eleven-acre campus in Rome. The Rome Prize and Italian Fellowship winners were presented on April 12, 2018, during the Arthur and Janet C. Ross Rome Prize Ceremony in the Frederick P. Rose Auditorium at Cooper Union in New York." 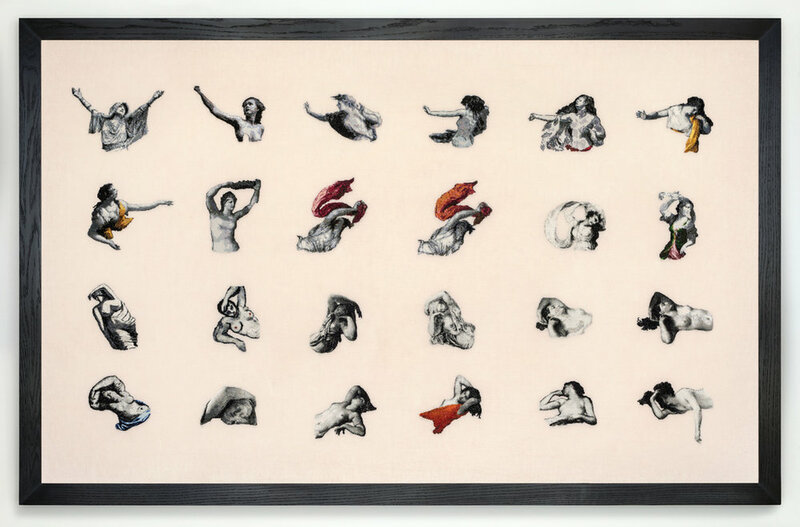 Elaine Reichek, Toutes les filles (All the Girls), 2016–17, hand embroidery on linen, 50 1/2 x 79". "Everything old is new again, and vice versa. 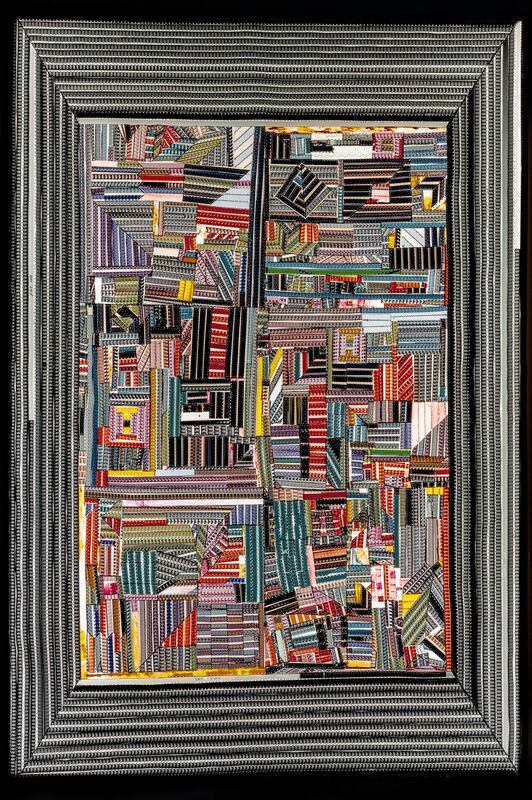 Elaine Reichek is a New York–born and –bred artist who has long engaged with some of the women of ancient Greek myths in her works, often via hand embroidery and digital sewing. Her latest exhibition, “Now If I Had Been Writing This Story,” which takes its title from a poem by Stevie Smith, features ten works from the past eleven years and is on view at the Secession in Vienna from April 13 to June 3, 2018." 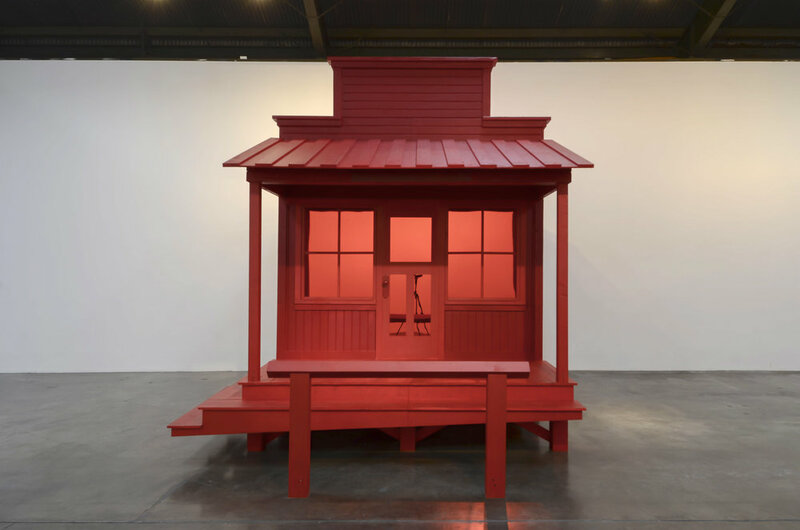 Philadelphia Style Mag - "Art Adventures: The Best and Most Instagramable of The Armory Show"
"This intensely hued, large-scale work by artist Rachel Lachowicz, is modeled after three structures from a Clint Eastwood film and painted entirely in a bright red lipstick that the Los Angeles based artist makes herself and melts down. The eye-catching work captures the viewer’s attention with its reflective windows, and signals a feminist intervention in the classically male, western sheriff station." Sabrina Gschwandtner in LensCulture's "35 Photographers to Watch: Celebrating International Women’s Day 2018"
"In honor of International Women’s Day, we reached out to an impressive network of female curators, photo editors, program directors, and photographers to compile a list of women who are making remarkable photographic work today. Our associate editor, Coralie Kraft, shares her thoughts on the inspiring range of projects that emerged—"
After a remarkable 24 years, the Bergamot Station ltd. Arts Center in Santa Monica is closing. Shoshana Wayne Gallery will relocate and reopen with an exciting new exhibition program. Bergamot Station opened in September 1994. Its founders, Shoshana and Wayne Blank, had the vision to convert dilapidated industrial structures into a vibrant arts center –a concept that ultimately revived the art scene in Los Angeles following the 1994 LA Riots and earthquake –two historical events that deeply affected LA’s social culture. The success of the arts center was always driven by its inclusivity and its core mission of being a cultural stop free and open to all. It has been home to renowned art galleries, architects, and creative businesses. At its inception, several of LA’s best galleries moved to the arts center including Patricia Faure, Rosamund Felson and Burnett Miller. 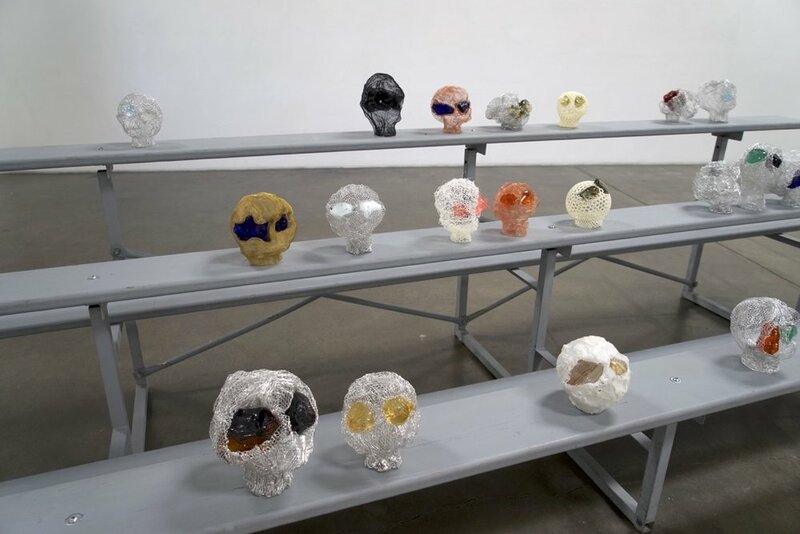 Substantial exhibitions of work by Robert Mapplethorpe, Mike Kelley, Anselm Kiefer, Balthus, Roni Horn, Antony Gormley, Mark Bradford, Yoko Ono, Beatrice Wood and many more have been shown at Bergamot Station, giving California residents a chance to have a firsthand experience of work by pivotal artists. As such, the arts center became a must-see destination for curators, artists, art collectors, writers and art students. Over the years, the arts center has hosted numerous fundraising events for local and national charities as well as political events for the likes of Bill Clinton, Barack Obama, Hillary Clinton, Sheila Kuehl and many more. The arts center has welcomed countless schools, children and adults of all ages and needs for gallery tours and talks. In addition, Bergamot Station has engaged the community through special seasonal events and film screenings. Beyond its local impact, Bergamot Station has had an influence on cities worldwide including Paris where a similar concept was employed. Recently, Bergamot Station’s "People Park" was selected by the city of Berlin to be recreated and permanently installed in Berlin’s International Garden Park. The full-scale exact replica titled “Los Angeles Garden” is presented by German artist Martin Kaltwasser, featuring all elements of our very own "People Park" (palm trees, benches, fencing, and surrounding parking lot), it opened permanently to a very enthusiastic public in April 2017. While the Bergamot Station Arts Center as you have known it for the last 24 years has come to an end, the property will be renamed and managed by the city with future plans for redevelopment. Shoshana Wayne Gallery looks forward to this welcome opportunity for change and a fresh start. We thank you for your continued support over the years and look forward to seeing you soon at our new location. Rachel Lachowicz listed in Artillery Magazine's "Best in Show 2017"
"Lachowicz took what has become a signature material for her to the furthest conceptual (and arguably physical) limits with a show that was breathtaking in scope from the most elemental (claim of habitat) to the most ambitious and abstract (notions of order, progression and moral hierarchy, and more urgently, the gendering of order and hierarchy). This was a lipstick trace to set a town on fire—and we enjoyed it." 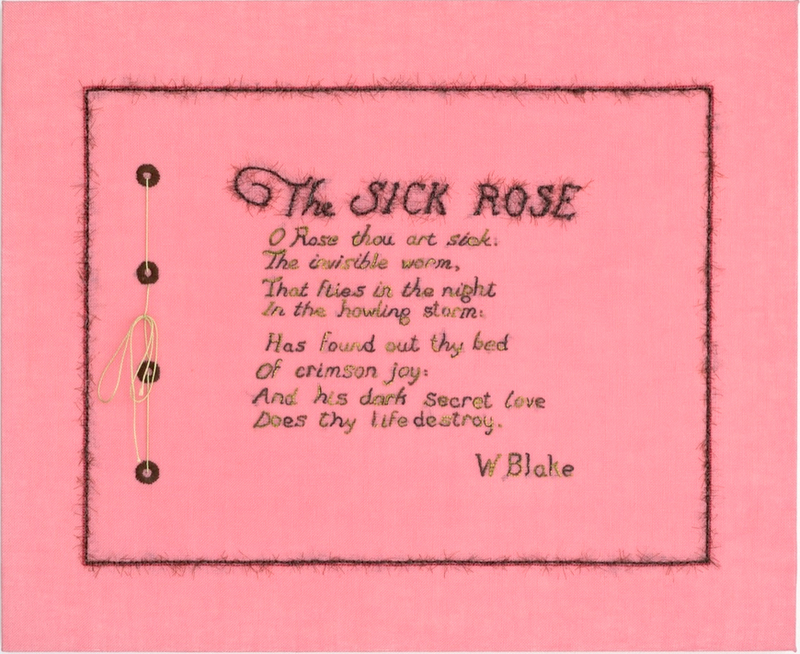 Elaine Reichek included in Artsy's "11 Artists Using Embroidery in Radical Ways"
Shirley Tse featured in Artsy's "10 L.A. Artists Whose Work You Probably Don’t Know—but Should"